Covering content strategy and the production process from inception to launch; Distilled’s Phil Nottingham highlights the key creative and technical tactics required to win the internet with video, whether your budget is in the hundreds or hundreds of thousands. Sometimes the hardest part of an audit is figuring out where to start. Fortunately Annie Cushing is on hand to help. She shares her own 200+ point SEO Audit checklist complete with links to the tools she uses for each task; use this framework to super-charge your auditing process. Agency-side or in-house, you have to make your pitch. The winners create proposals that stand out and makes sense. Portent CEO Ian Lurie shows you how he mixes humor, data and description to create and deliver winning proposals. A moderated session discussing the latest news and updates from the world of search. A moderated session which rounded-up the two days of the conference. 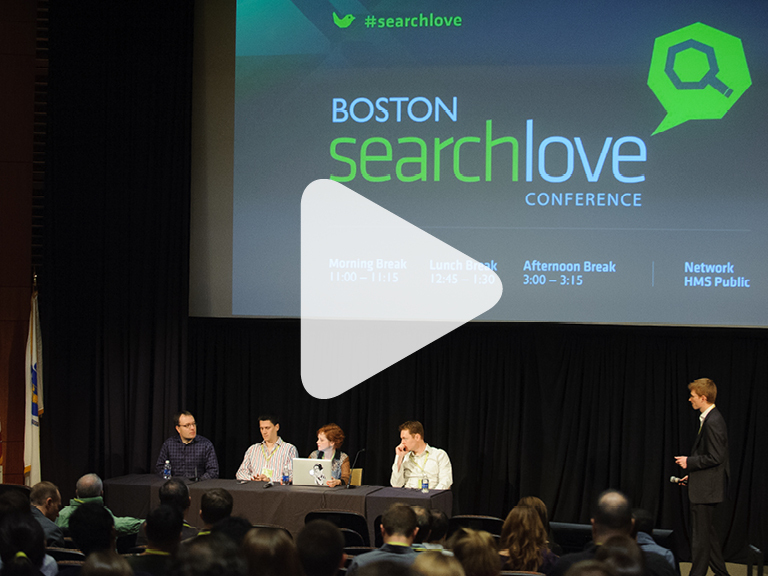 Our panel of experts discussed the latest news, updates and predictions from the world of search. Post iAcquire’s de-indexation Mike King speaks candidly about the road to reinclusion via a comprehensive content and marketing strategy. He shares his experiences, revealing the actual cost of the tactics they employed and the results they achieved. Founder and CEO of SparkBuy (and now working for Google since their acquisition of SparkBuy) Dan Shapiro believes it’s the CEO’s job to create serendipity. He talks about his own experiences and illustrates how to increase the chance of awesome encounters and critically how to then decide where to invest time in following up. Is SEO solely for those with deep pockets? Definitely not. Entrepreneur and Return on Digital CEO Guy Levine shares his experiences of bootstrapped Small Business SEO and includes case studies to illustrate what worked with costs and results. Aiming to put an end to the speculation about whether social signals have a direct influence on achieving high rankings, Stickyeyes’ Head of Social Media, Heather Healy delves into data sets from competitive sectors to demonstrate where social signals matter and where they don’t. More commonly known as Oilman, Todd has worked in the SEO industry since 1998 and has seen first-hand how the Google algorithm has changed over the years. Within this session he focuses on Penguin penalties – how to diagnose them, how to clean up your backlink profile and how to get reincluded. Conversion Tracking & Online/Offline Attribution- A long time advocate of integrating online and offline marketing efforts to gain a clearer picture of what’s driving ROI, Lauren, Sr. Director of Online Marketing at Salesforce.com shares her own methodology to improve attribution and conversion tracking and increase ROI.